In fact, if you’re starting a course now, by the time you’ve finished it, it’s even further behind. But it’s not their fault, how on earth could they keep up with the speed of change? The change is remarkable. What I’m doing now, some of these things, I won’t be doing after Christmas. In fact, I may be doing something new. Now the basics are the same and the basics, I have to say, are the framework for marketing. No matter whether it’s in the 1920s or today, but it’s the way it’s done. Generally marketing is often done through advertising and it’s done through interruption marketing. So in other words, I watch TV and then they break off to show me some adverts; I’m annoyed, I go make a cup of tea, I turn the channel and TiVo the other show. Fortunately I live in the UK and we have the BBC, and what I love is that the BBC has no adverts, it’s funded by the licensee, and there are no adverts. So you get to watch movies, sports shows, programs, all the way through with no breaks, like at a movie. Even at the movies, they will give you ads at the beginning. When you’re driving along, there’s billboards, and they’re all trying to catch your attention, they’re trying to interrupt you, and you did not ask for any of them. So, we turn it around and work it so that people come to you, but you have to tempt people to come to you via a content marketing system. That, capped with a plan, a marketing strategy, but using modern tools. The theory of it is very simple. It uses the Internet, it uses websites and social media and all these things that if that makes you go “Ugh”, that’s because that means you are not going to be in business or successful for very much longer. Someone younger, someone who does understand these things, who’s grown up with them is going to use them and is going to find it easy. You need to figure out customer acquisition. You don’t want to be figuring out advertising, you need to figure out how to acquire customers and once you’ve acquired customers, you then need to figure out how to keep them being a customer, make them buy again and again and then how to make them refer you to their friends and colleagues. This is stuff that just is not taught. In the perpetual sales cycle system, we start off with a presence, a website, and then that is the hub for all your activity. We then follow with setting up our social media channels correctly. We don’t necessarily have to use them all but we have a presence there. So we’ve claimed our spot and we might just use only Facebook or Twitter or just Pinterest or Instagram or YouTube. Then we need to figure out who is our perfect potential customer and we figure out who they are and figure out what type of content to give that to them because once we know who they are we then know what are their loves and their likes. Do they like watching videos? Do they listen to podcasts? Do they read? Would they rather be sent stuff in the mail? Etc. Then we start to get to know what they are like so we can generate the content for them. The next is we have to offer them something, offer them what is sometimes called an ethical bribe, but offer them something that they have to opt in and give their e-mail in exchange, they give their permission. Yyou make it very clear what’s going to happen, they give their permission to accept advertising messages from you or information, because of course you don’t say it’s “advertising messages”, you’re going to explain “It’s very, very helpful information” and they request that. You see the difference? We’re not interrupting, they’ve asked for it, we’ve told them what they’re going to get, we give them a sample with that opt-in bribe, that lead magnet, and they enter their name and e-mail. You’ve all done this, in fact, if you want to see this in action, go to marketingforowners.com/71. It’s nothing for sale, don’t you worry, but if you get that not only is it a fabulous report, it’s a book, a download book. Not only is it fabulous and there are things in there that will save you money, if you look at it, it will save you time also. But you will also then be followed up with tons of helpful information that helps you — it doesn’t help me, it helps you. You will just see that as an example of how this works. Eventually when an offer is made, you would feel inclined to consider making a purchase. At the moment, we have a course that is being developed and we are gradually developing a step-by-step paid (yes, sorry you would have to pay), version of the perpetual sales cycle, but each module is being created individually as a standalone, so you can pick and choose or eventually take the whole lot. Now the first module in this course is how to set up your easy website, and it is very very simple. But how to set up a website geared to get this system working. It will be coming in a couple of weeks I think, but that will be offered, and people who are on the list will get the best offer, it will be of benefit to them rather than everyone else. But once you’ve made a purchase if you decide to, so I’m not talking about my system per se, I mean anyone, once you’ve made a purchase you then become a customer and that’s a big difference between someone who is a lead who is being nurtured to becoming a customer, you are then referred to as one of our customers. Then we start to really impress you. First of all we impress with the way we deal with you as a customer, we impress you with how we look after you afterwards, how we tell you how much we appreciate you, and eventually you may buy something again when you need it. Then we are going to impress you all over again to the point and similar to Amazon. Some people have different minds about Amazon, but come on, everyone buys from Amazon, and they don’t have to advertise. Everyone does, because they sell the same products that everyone else sells more efficiently and a lower price and they just have it all. You say, “Ah! Because we took a course at Marketing for Owners”, and you see how this works, you would be impressed enough, you would mention it to someone else. I don’t have to advertise to them, they come to have a look and it’s up to them, it’s their decision. This is the thing, this does not get taught in college, that’s the entire system, it then perpetuates and starts all over again, and that’s why it’s a cycle. So, this doesn’t get taught in college, you would never learn it, there, don’t waste your time or money, be very very careful who you do learn from but do not waste your time, most of this, if it’s available you can find for free online, on YouTube, on the Internet. There are courses on Udemy, there are all sorts of free courses, paid courses, memberships, everything. 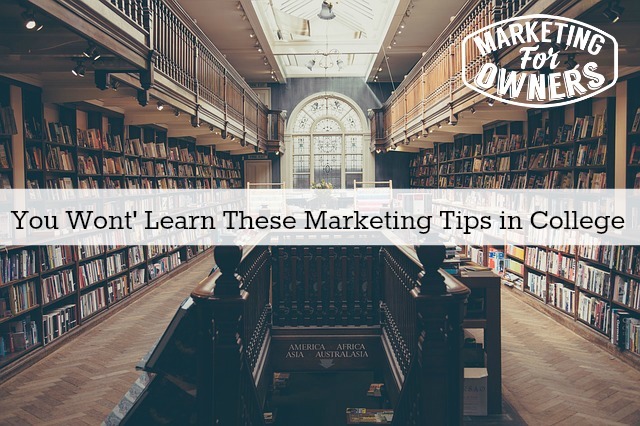 If you even want to know where best to learn, send me an e-mail to jon@marketingforowners.com and I’ll let you know if I can tell you. If I can’t, I’ll point you in the direction where you can best learn and there’ll be nothing in it for me, don’t you worry, I like you. Now, today is a Wednesday so we have a friendly follow. 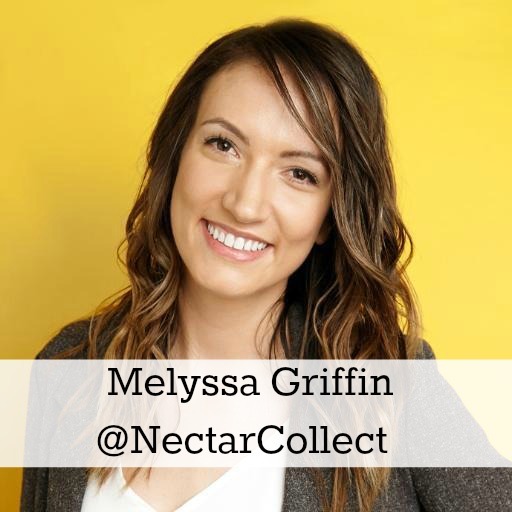 Today it’s Melyssa Griffin. Now her website is thenectarcollective.com and her handle on twitter is nectarcollect. But Melyssa is lovely. She has a wonderful blog, a very honest, if you look at her latest blog in October, she explains how she got on with her goals that she’d set publicly for September and the goals she set for October. Now I love that, she has 50 odd comments the last time I looked. She also has a wonderful Pinterest, course, so you’ll notice how her image at the top is gigantic, that’s because she knows how to use Pinterest. So, go have a look at Melyssa and her blog and I’ll have something good for you tomorrow. What have you learned in the school of hard knocks? ?